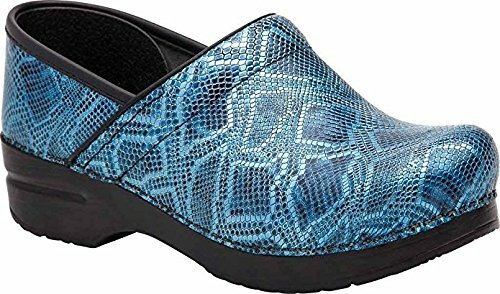 Dansko Women’s Professional Clogs scored high marks in all categories and are our top pick. Being on your feet all day can really take a toll on leg health and overall health too. These professional clogs allow you to be on your feet for hours at a time without lower back, knee, ankle, or foot pain. The heel is only 1 3/4″ and is comfortable to wear when working long hours. The instep collar has been padded for maximum comfort, along with the roomy toe box that is formed provides you with plenty of room. There are many different shapes, designs, and styles of nursing shoes on the market. These choices can make it confusing to determine which are best for your needs. Different nursing shoes function differently and have different characteristics so while one pair may not appeal to one person, they may work just fine for another. In this buyer’s guide, we pulled together tons of information that includes some of the most important considerations you should look at when searching for the perfect nursing shoes. Comfort, safety, support, and style are definitely top factors in finding the right nursing shoe. We spent over 7 days researching and testing 15 different types of nursing shoes and found that overall weight of the shoes, comfort, and support were most important. The information provided here will take away the confusion and difficulty you might experience while trying to find the right pair of nursing shoes. After reading this guide you will be able to make an informed decision that will be just right to accommodate the number of hours you spend on your feet as well as your own personal preferences. Dansko is known for the all-day comfort they provide. They have exceptional arch support and a comfortable design that allows nurses to be on their feet for long periods of time without experiencing feet, knee, or lower back pain. The heel measures 1 ¾” with a ¾” platform. The instep collar is padded and the roomy, reinforced box for the toes provides plenty of protection. The polyurethane outsole has a rocker bottom that provides the right amount of shock absorption along with a wider heel strike that gives the wearer greater stability. These Women’s Professional Clogs provide wearers with plenty of choices in heel height and styles, ensuring there is a perfect choice for everyone. These comfortable clogs come in a variety of colors and patterns. The many styles of Dansko Professional Clogs all feature the same quality workmanship that all Dansko shoes have; carefully chosen materials and precise construction that promote good leg, back, and foot health so wearers can stand without pain or fatigue. You’ll never have to choose between feeling good and looking good when wearing Dankso Professional Clogs. 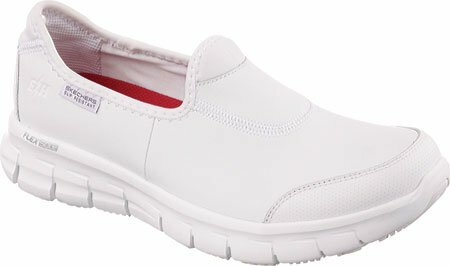 If you work many long shifts, Skechers shoes are just what you need. They provide wearers with all-day, lightweight comfort that reduces the amount of stress and fatigue your body experiences during long shifts. The slip-resistant sole provides you with exceptional traction and the leathers are waterproof, making cleanup and protection against contamination a snap. They are designed to put on and take off easily but are designed to not fall off -even when you have to run. These shoes are also great if you suffer from planter fasciitis. They were originally designed for nurses and other professionals in the healthcare field but once word got out, veterinarians, food service workers, teachers and many others are enjoying their features and all day comfort. Skechers shoes are available in a wide range of sizes and colors. 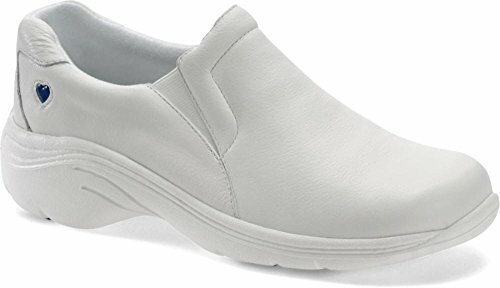 You will love wearing these slip-on nursing shoes from Nurse Mates Dove Lites Collection. Just like the name states, they are super lightweight and very comfortable. The uppers are made from full-grain leather that has a stain resistant finish that helps them to always look great. The lightweight outsoles contain rubber inserts that improve slip resistance and wear. These Dove Lites have a 1 ½” heel with a steel shank that is sturdy and supportive to give you the best arch support you can get. This extra support reduces fatigue and doesn’t add weight to the shoe. The outsoles are made of EVA (a material similar to rubber) and provide extra support and cushioning. The collar of the shoe is padded and features elastic at the opening so you can easily slip your foot in while still enjoying a proper fit. These shoes come in a variety of colors and are available in Medium sizes 5-10 and 11 and Wide 6 -10 and 11. Nursing is a physically demanding career that involves being on your feet for long periods of time. One of the best ways to reduce leg and foot fatigue as well as back strain is to wear a proper, high-quality shoe that offers support, safety, and comfort. With the many different choices available, choosing the best shoes for your specific needs can be a real challenge. The right nursing shoe is going to provide you with all the points on your list: comfort, support, safety, and style. The three top-rated nursing shoe choices listed above are perfect examples of the kind of nursing shoe that you want to find. They are available in a variety of sizes and widths, they offer colors and patterns so you can express your own unique personality, and they provide you with plenty of support, safety, and comfort. If the top choices featured above are not what you were looking for, we provided this buyer’s guide with all the information you need to learn about the different choices out there and how to determine high-quality nursing shoes from the ones you shouldn’t spend your money on. The information in this convenient guide will make it easier for you to find the right nursing shoes for your needs. There are several factors you should take note of while looking for good quality nursing shoes. These factors are listed and explained below – we want to educate you on why they are important and how to ensure that the shoes you are considering will meet your criteria. These factors are the same whether you are shopping for nursing shoes for men or women. Support & Stability – Because of the long hours that nurses spend on their feet, it is very important that the shoes they purchase have good stability and support. This is important not only for comfort but for health reasons as well. Ankle and back support is very important because it can reduce or eliminating pain in the legs, feet or back. Without good shoe support, you could have long-term back and leg problems in the future. Factors that have a big impact on how a shoe performs are shape, material, construction, design, and heel height. Having the proper support can save your back during long shifts. Weight & Comfort – The weight of your shoes may not be something you think about until working a long shift in heavy shoes. If you sit most of the day you can get away with heavier shoes, but nurses rarely sit down much. The lighter the shoe the better you will feel and the less fatigue you will have. If the shoe is extremely lightweight it will mention this in the shoe’s description. You want to look for shoes that state they are lightweight and made from materials that don’t add weight to the shoe. Because this is such an important matter, many high-quality nursing shoes are made from lightweight materials. Design & Shape – There are many different shapes and designs of nursing shoes to choose from. These designs can also accommodate many types of medical conditions that involve the feet. Some design styles include tennis or running shoes, crocs, athletic sneakers, and clogs. There are advantages and disadvantages to each type of shoe. Some of these advantages will depend on the surface you work on, the medical condition you have, and the health of your feet. If you have a serious foot condition, your podiatrist will be able to recommend the best type of nursing shoe that will take your medical condition into consideration. Even though it’s tempting to choose a shoe based on color and/or pattern, you want to choose comfortable, supportive shoes that do a great job supporting your ankles, feet and back. When you are at the end of a shift and you feel like your back will never be the same again, you realize why it is never good to choose based solely on colors and patterns. If you’re on your feet a lot, comfort should always come before style. Fortunately, with all three of the top choices provided for you in this guide, you don’t have to choose between style and comfort because you can have both. Slip Resistance – This is a very important feature in nursing shoes. This is especially the case in situations where liquids might end up on the floor. If you want added slip resistance, there are shoe grips that can be purchased separately. Don’t rely on separate shoe grips as the only source of slip resistance. The shoe itself should have good grip even without the additional grips. Work Function – Take into consideration what you will be doing during your work shifts so you can look for shoes that accommodate those functions. Do you stand a lot during the day? Do you lift heavy objects? (even people) Sometimes nurses have been known to wear two different types of shoes during their work day. When they are sitting for long periods of time they will wear something more comfortable and softer but keep a slip-resistant, more protective pair for when they do rounds or are working in a high traffic area where they will be on their feet for awhile. Warranty & Price – Don’t choose a pair of nursing shoes just because they are expensive. While you don’t want to buy cheap, you can find a large selection of shoes in the mid-range that are high-quality, excellent shoes. You want to purchase shoes that offer the benefits and quality you need. If they cost more, don’t be afraid to spend that money, it’ll be worth it, but look at the shoes overall and not just the price when making your selections. The cost of nursing shoes will be affected by their design and construction, the materials, the brand name and added features, if any. A high-quality pair of shoes can last as much as two times longer than a lesser quality pair making them cheaper overall. Look for shoes that offer guarantees and warranties. This shows that the company stands behind their quality. We provided you with some helpful tips that will make the purchase process much less confusing. Apply these tips when you start researching and shopping and you will find the right shoes for your needs. Purchase two different pairs of shoes and alternate – Many nurses say that having two pairs of nursing shoes helps them achieve the best of both worlds by offering back and foot support with one pair and comfort with the other. This method allows your feet the chance to vary their position in shoes which gives portions of the foot a well-deserved rest. If the medical facility allows it, wear nursing shoes that are like running shoes- This type of shoe offers a lot of support and are great when you are on your feet for extended periods of time. Get a professional opinion about your feet – If you spend a lot of time working on your feet, getting checked by a podiatrist can spare you serious health problems later. The exam will give you information on the shape of your feet and what potential or actual medical conditions you may have regarding your feet. The doctor will be able to suggest certain features that will help reduce leg, back, and foot pain. Plan to see the foot doctor regularly when you are someone who is always on their feet for hours at a time. Doing this will prevent certain medical conditions from becoming worse. Don’t allow cost to be the only deciding factor – Look at the shoe’s features and not just the price. You want to spend your money on shoes that will benefit your feet and legs and that are worth the extra money only if its features and quality are superior. Poorly made shoes can cause health issues too. Choose function and benefits over design – This isn’t a fun tip but it is true. Never choose nursing shoes because of the design unless ALL other aspects have been met by the shoes. THEN you can choose the design you like. Otherwise, focus on the benefits and function of the shoes first and foremost. Your legs, back and feet will thank you. Choosing a proper pair or pairs of nursing shoes is extremely important in determining how you will feel while working your shift and afterwards. Nurses put a lot of demands on their feet and legs. Finding shoes that are designed for nurses and the demands you endure will help keep your body happy and healthy. There are many great nursing shoe companies on the market. Make sure you read feedback on the companies that manufacture the shoes you are thinking of purchasing. Read comments from other customers and see what they are saying, both good and bad, about the shoes you are interested in. Doing these things ahead of time will help ensure that you choose the best pair of nursing shoes you can get . You will definitely appreciate the quality and comfort of your new shoes when you are working your next 12 hour shift.